Mens Plaid Pants In Red. Own a classically bold print with these mens plaid pants by Michael Score. Tartan pants designed with a slim fit for a fitted look that’s also workwear-approved. Plaid pattern features a brilliant combination of red, white, yellow and navy blue all over trousers. Constructed with front and back pockets, belt loops, zipper fly with hook and bar closure. 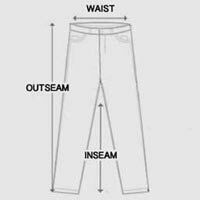 Slim fit pants made with a smooth cotton blend that has no stretch. Go for these mens plaid pants to make a tailored statement in checkered red. Model is wearing size 33. Sizes are measured in inches. For accurate measurements, check the table below.